The Pompton Plains Preschool is a state certified non-profit organization providing preschool education since 1946. We are a fully academic preschool, with structured learning and enrichment. We are not a daycare. Pompton Plains Preschool teachers and staff members provide a warm, safe and nurturing environment for your children. Our caring and dedicated staff continues to develop programs using a combination of academics, imaginative play and creative projects which are designed to keep your child interested and excited to learn. We have incorporated the "NJ Cares Creative Curriculum" into our current programs. The Little Steps, Preschool 3's and Pre-K programs are tailored to fit the developmental, social and educational needs of our students to prepare them for their full day of kindergarten and future learning. We limit our enrollment to allow us to give specialized care to our students. We encourage positive student behavior with incentives. Hugs and High-fives happen! 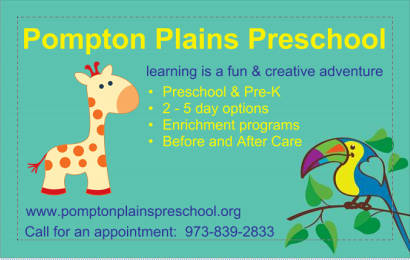 The Pompton Plains Preschool has grown! We now offer exciting new programs for our students who attend the lunch buddies program. We have added daily enrichment classes to enhance the students learning experience. The Happy Dance, LLC, Italian language arts, Tumble Zone, Melody Mom, All Sorts of Sports etc, are just some of this years line-up of programs. Convenient to public transportation for easy drop-off and pick-up from your daily commute. Enrichment Program instructors with background checks and fingerprinting. Our staff teachers are not only qualified on paper but also consist of mommies who have children in the Pequannock school system. We are mommies who know, care and are here for your children. We are here to provide your children with a safe, happy and loving academic learning environment.